America's Next Generation Of Muslims Insists On Crafting Its Own Story A new generation of American Muslims has moved from defending itself, as Muslim communities did in the aftermath of the Sept. 11, 2001 attacks, to defining itself. In collaboration with National Geographic, NPR's Leila Fadel meets the mosaic of young U.S. Muslims. 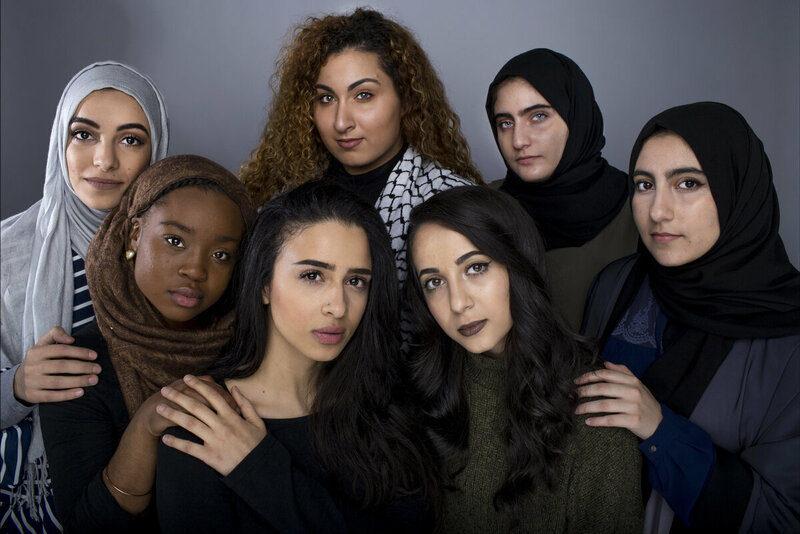 American Muslim college students in Ohio (front row: left to right) Halimah Muhammad (in brown hijab), Fatima Shendy, Zaina Salem, Ruba Abu-Amara, (back row: left to right) Arkann Al-Khalilee (in gray hijab), Nora Hmeidan and Lama Abu-Amara appear in an image that was featured in Uhuru, a Kent State University magazine in an issue on identity and race. Many American Muslims found themselves on the defensive after the Sept. 11, 2001, attacks. But this generation says it is tired of being expected to apologize. Instead, young Muslims are determined to take control of their own stories. And they are creating fresh paths for the estimated 3.45 million Muslims in America. Rather than defending themselves, they are defining themselves. In a tense political climate, they are worried less about explaining Islam to others and more about contributing to the American tapestry through their unique perspectives. "There is a distinctive American Islam that is emerging," says Jihad Turk. Turk is the head of California-based Bayan Claremont, the only Islamic graduate school in the country. There, he tells his students that "the sign of us having arrived in America is not just that we are consumers of culture but that we're producers of culture. That we contribute to art and the aesthetic of what it means to be an American." Over the past year, NPR correspondent Leila Fadel traveled across the country — from Chicago to Los Angeles to northern California to southern Texas — to meet young Muslims expressing themselves in new ways. Below is a montage of what she found. Her stories were reported in collaboration with National Geographic. You can read and see more in the May issue of the magazine. Makkah Ali: "What are you interested in?" Makkah Ali (left) and Ikhlas Saleem created the podcast Identity Politics, on which they talk about their experiences as black women, as Muslims and as millennials in America. Ikhlas Saleem and Makkah Ali are best friends — each from Atlanta, from black Muslim communities, and married. They say they were tired of being asked to react to Muslims doing bad things or bad things happening to Muslims. So they started their own podcast to ask the questions no one was asking them. 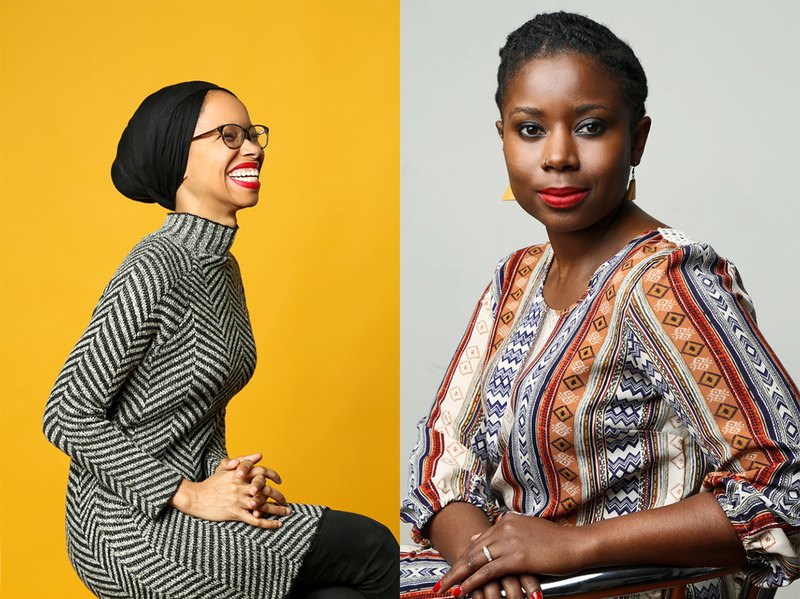 On Identity Politics, they talk about their experiences as black women, as Muslims and as millennials in America. The podcast is a lot like the two 28-year-olds who run it — alternately light and serious. Saleem has a graduate degree from Harvard, and Ali a graduate degree from George Mason University. They met as students at Wellesley College and say that when they are around each other, they don't have to "code switch" — or change how they communicate — they can just be. And that is what they want their podcast to be, too. They talk with guests about art, identity, race, the #MeToo movement, gender and religion. What they don't do, Saleem says, is "Islam 101." At the Muslim Protagonist conference in February in New York, where Muslims discussed how to be heroes of their own stories, Ali and Saleem encouraged students to do the work. "I want to see Muslims building their own platforms," Saleem tells the audience. "The only way you can represent is when you represent yourself." "Complicate the narrative," another panelist tells them. Ali and Saleem's podcast audience of about 3,000 listeners is mostly made up of young Muslims like themselves. More than half of Muslims in America came of age after the Sept. 11 attacks. And by not trying to appeal to a wider audience, they've actually attracted non-Muslim listeners, too, because the issues they discuss exist "outside of Islam and within Islam." "We live day to day," Ali says, "we have to manage our anger and our budgets and relationships, and we're curious about various things in the world." 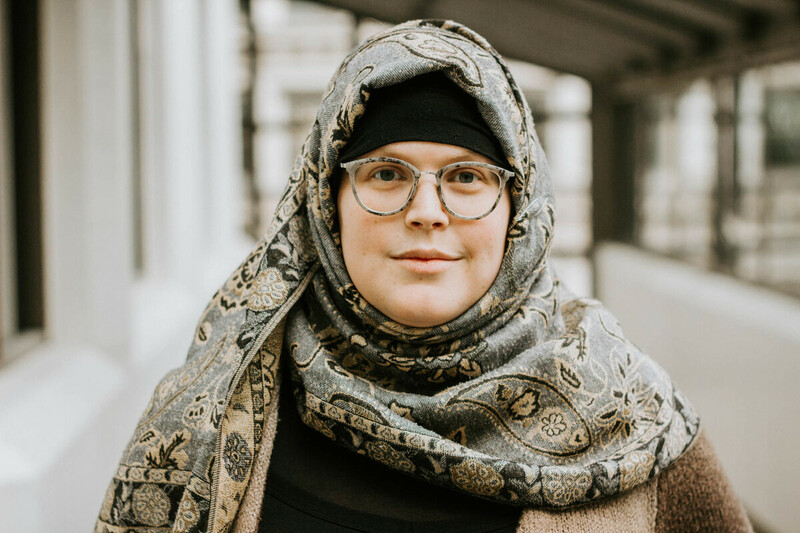 Mahdia Lynn is executive director of Masjid al-Rabia, a unique space as an LGBTQ-affirming and women-centered mosque in Chicago. Mahdia Lynn believes that every Muslim "should have a right to pray without fear of violence or excommunication." The 30-year-old is a transgender Muslim woman and executive director of Masjid al-Rabia. It's a unique space as an LGBTQ-affirming and women-centered mosque in Chicago; its founders call it a "mosque for all Muslims." For now, the community runs Friday prayer out of the Second Unitarian Church. Each week, members put out their donated library: translated Qurans and Islamic texts mostly from Muslim feminist writers. The mosque is "radically inclusive," founders say, so that anyone who may feel marginalized in other Muslim spaces feels welcome here. Islam, like other faith traditions, struggles with inclusion of LGBTQ people and homophobia, so Masjid al-Rabia is rare. But inclusive spaces like it are growing; there is a Unity Mosque in Toronto, an annual LGBTQ Muslim retreat and informal prayer circles popping up in cities across America. Blair Imani, a 24-year-old, bisexual, Muslim woman, author and activist, says Masjid al-Rabia gives LGBTQ Muslims ownership over an affirming worship space. "It's a shift from the idea that we can't be Muslim because we're LGBT," she says. "I'm bisexual and Muslim at the same time and that still blows people's minds and it really shouldn't. I don't find the controversy within myself. It's mostly from the external." Children in South Los Angeles celebrate Eid al-Fitr, which marks the end of Ramadan, the holy month of fasting, at a picnic co-sponsored by Islah LA, a black Muslim community center. 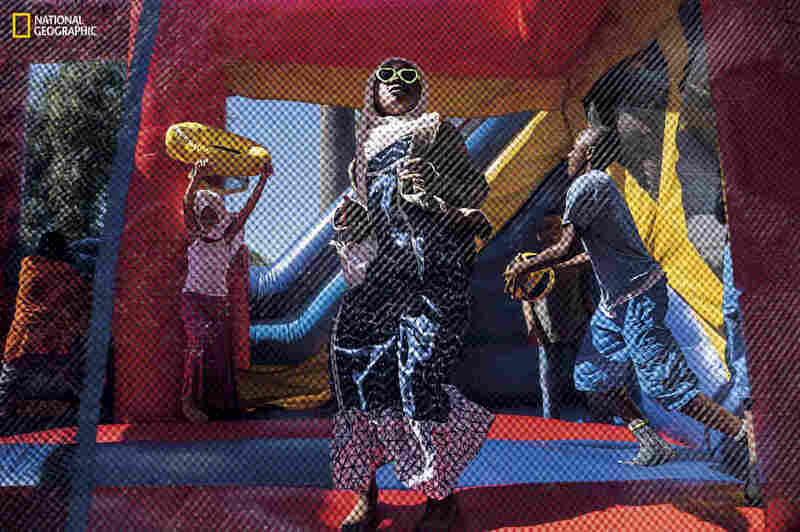 In South Los Angeles, Jihad Saafir is transforming his father's storefront mosque into something much more ambitious to include a school and community center. It's called Islah LA; "islah" is the Arabic word for "reform." "We deal with what has happened historically in the African-American community and the African community. So we make sure that the children are aware of who they are, their identity." His generation of black Muslims and the next is reclaiming, reviving and retaining institutions their parents and grandparents built, while highlighting the diverse traditions of their communities in the U.S. About a third of U.S.-born Muslims are black Muslims, and yet many feel eclipsed by the immigrant story. "Not only are we losing the generation before us and their leadership, but we're also being sort of erased," said Su'ad Abdul Khabeer, author of Muslim Cool: Race, Religion and Hip Hop in the United States. She says that erasure comes in part from the focus, negative or positive, on Muslim immigrant communities and a depiction of Islam as only a foreign faith. So black Muslims are "reclaiming their identities as opposed to defining them." Khabeer runs Sapelo Square, a website that serves as a resource for and about black Muslims. On religious holidays, people post pictures of their celebrations on social media with the hashtag: #blackouteid. And black Muslims, Khabeer says, never went on the defensive about the faith because Islam in black communities has always been a form of "self-determination." On the South Side of Chicago, the Inner-City Muslim Action Network goes by the acronym IMAN. It's the Arabic word for "faith," and faith is the action in this organization. The Muslim nonprofit sees social activism and community organizing as the way to keep Islam relevant to the next generation. The group's founder, Rami Nashashibi, says, "We're trying to celebrate the legacy of the spirit of a transformational, empowering, inspirational Islam that is not just constantly apologizing or having to explain itself." The work, he says, honors the tradition of Islam in urban communities where the religion was adopted as a tool of empowerment. Sara Hamdan: "The work ... is worship"
IMAN is a coalition of black, South Asian, Arab, Latino and other Muslims. Some from the South Side, others from the suburbs. They try to effect change on the issues that matter in the lives of residents of urban communities but are neglected. These include food access, health care at their clinics, criminal justice reform and a supportive re-entry program for people leaving prison. "The work, in and of itself, is worship," says Sara Hamdan of IMAN, "in that there's blessing in all the service that we're doing, in all the organizing we're doing. That can be my way of worshipping." Hamdan is in her 20s and wears a headscarf. She says putting it on was a spiritual decision, but also, she didn't want to "pass anymore." In the face of being painted as good or bad, villain or victim, she wanted to be a visible Muslim who is neither. IMAN recently opened a branch in Atlanta. For this work, Nashashibi was awarded a MacArthur Foundation "genius grant" for "building bridges across racial, religious, and socioeconomic divides to confront the challenges of poverty and disinvestment in urban communities." 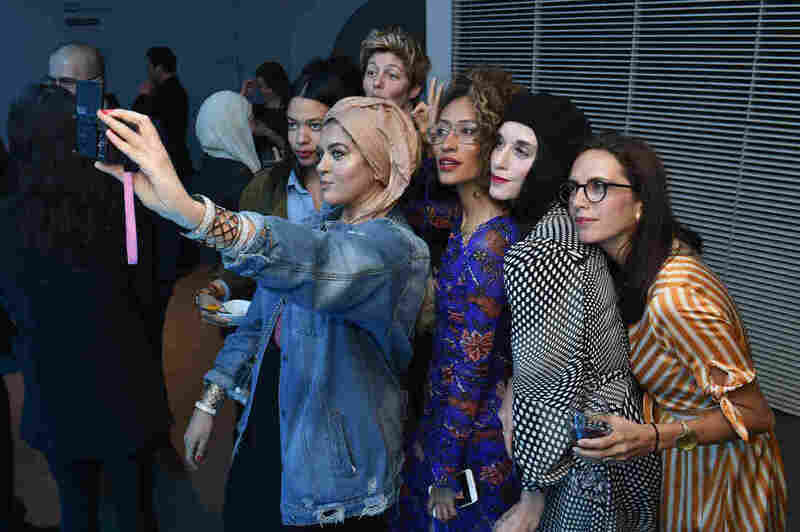 Amani Al-Khatahtbeh: "Can't be put in a box"
Amani Al-Khatahtbeh (center, holding camera), founder of MuslimGirl, and Elaine Welteroth (center, in glasses), former editor-in-chief of Teen Vogue, join a group selfie at National Geographic's premiere screening of America Inside out with Katie Couric in April in New York City. From "Austere Attire" to "Haute Hijab," young Muslim fashion designers are starting their own lines to give Muslim women who want to dress modestly ways to do it with confidence and style. And the fashion industry is jumping on board. Most recently, Macy's started selling a modest fashion line featuring maxi dresses and hijabs. Fashion designer DKNY started a Ramadan collection in 2014, Nike sells a sports hijab called the "Pro Hijab," and American Eagle debuted a denim hijab last year. The nail polish giant Orly partnered with MuslimGirl.com founder Amani Al-Khatahtbeh to create a "breathable" polish called #HalalPaint so young women can paint their nails and still pray. Typically, Muslim women don't pray with nail polish on because water doesn't penetrate the lacquer when they wash for prayer. Khatahtbeh started the MuslimGirl website from her bedroom as a teenager, writing about issues that interest her as a Muslim American woman, from fashion to identity. The problem, she says, is that the estimated 1.8 billion Muslims in the world are constantly referenced as one entity even though Muslims are so diverse. MuslimGirl.com, she says, amplifies stories of women like her — as well as women who are not like her. "Because you know we, just like any women ... can't be put in a box." Jenin Ajrami: "Men I've grown up with crying"
When the mosque in Victoria, Texas, burned in January 2017, it was the first time young people in this community saw their parents sob. Sixteen-year-old Jenin Ajrami didn't talk about her religion at school, afraid of discrimination. Now, she Snapchats her friends from the mosque. "I just send them a picture of me in the hijab," she says. "They don't expect it from me because I don't cover my hair at school." I just send [friends] a picture of me in the hijab. They don't expect it from me because I don't cover my hair at school. Last year, more than 100 mosques were targeted with arson, threats or vandalism across the country, according to the Council on American-Islamic Relations. The FBI has tracked an increase in hate crimes against Muslims in 2015 and 2016. The incidents at mosques range from death threats to the buildings being torched like the one in Victoria. But overwhelming support came in from Victoria's community and around the world, helping the mosque raise over a million dollars. Now, the community southeast of San Antonio is rebuilding and hopes to be praying in a new mosque by this summer. Some of the young women at the Bosnian Islamic Cultural Center of Chicago say they're arguing with their parents because they want to cover their hair, but their parents won't let them out of fear they'll be attacked. Those who don't cover their hair outside the mosque say no one thinks they're Muslim — they don't fit the stereotype with their European looks. According to the Pew Research Center, Muslims in America hail from more than 75 countries, thus the country's more than 2,000 mosques vary widely in tradition and practice. 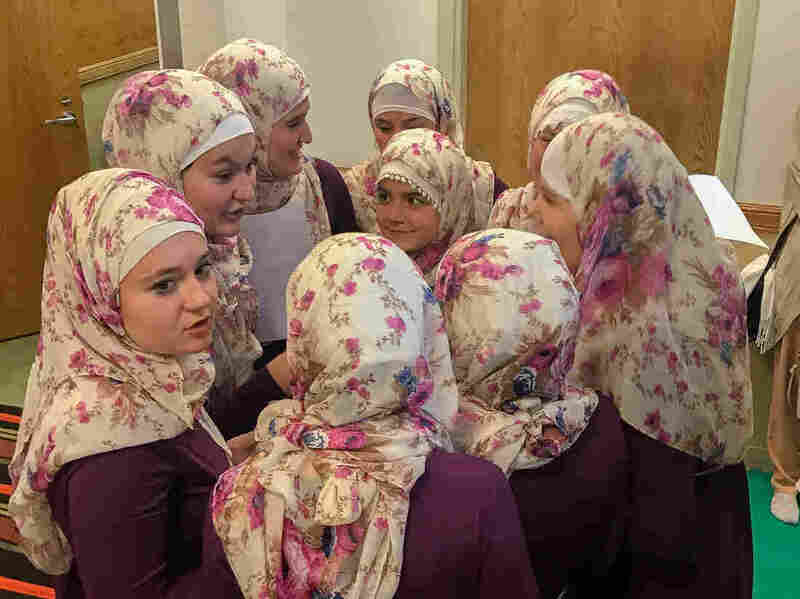 At this Bosnian mosque, they have a girls' choir that performs in front of the congregation. They sing about God, the Muslim prophet and Islam. Enessa Mehmedovic, 24, picked the outfits for the singers and organizes teens and young women from the center to volunteer in the larger community. She encourages them to wear their headscarves, even if they usually only wear it to pray, so people who see them know exactly who they are. Some women choose to wear the headscarf, others do not. Enessa Mehmedovic: "A walking representation"
"Being a walking representation of Islam is, like, so beautiful to me," Mehmedovic says, "because when someone looks at me what is the first thing they notice? That I'm Muslim."